Have you got your picnic blanket ready? Our annual church picnic will take place this Sunday – 9th September – at Killesberg. 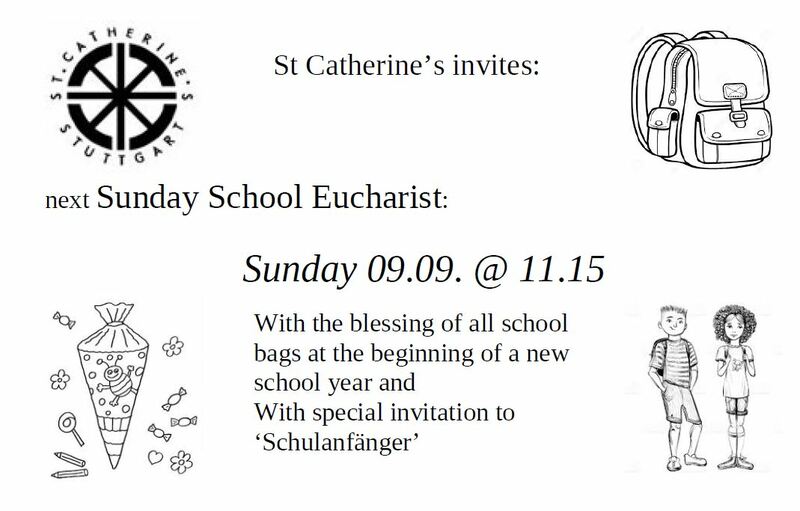 Come along after our back-to-school service and join in the fun. Bring your own picnic and a bit to share… We’ll meet as usual under the tree, with easy access to the toilets, play area and Killesberg tower. If you haven’t been before there is a list at the back of church of people who can offer lifts or show you the way on public transport. As we’re now in September, I wanted to let you know that Bible Study will begin again on Wednesday 19 September – and with a dinner. As we haven’t seen each other for a while I thought it would be nice to have the opportunity to catch up properly. If you would like to come along to the dinner, which would be at our usual time of 7.30pm, then please let me know so I can book us a table. And to those of you who aren’t able to come to Bible Study (very often) or have never been before, you are particularly welcome and we’d love to see you. Looking forward to seeing you all then, if not before! Our Sunday School programme will start up again on 16th September. Having enjoyed the chance to spend a little longer with the children over the summer, we will continue to start Sunday School at the beginning of the service, with the parents signing their children in before they go to church and everyone returning to church during the peace. Thursday 13th September – from 19:00 at Rote Kapelle A chance to chat, have a bite to eat and this time maybe a glass of wine instead of a beer? E-mail pints@stcatherines-stuttgart.de to find out more. Our next meeting will be on 27th September 2018 from 10 until 12 in the Anglican Centre. Please note that this is the FOURTH Thursday in the month not the usual THIRD, as I am on holiday during the third week of September and everybody in the group agreed to the change. See you then. Will meet on Monday 24th September – 19:00 at Injeera Please e-mail legs@stcatherines-stuttgart.de if you would like to join us. but spiritual content it had not !! praying for our children and those at St Catherine’s who work in education 09.09.
praying for our financial well-being and the opportunity to review that part of our discipleship 16. and 23.09.
the richness of sharing worship with the AKs 30.09.
possibly a baptism with the joys that brings as well as the reminder of our own baptism 07.10.
the celebration that is harvest and the thanksgiving, the sharing, the giving 14.10.
a focus on healing and prayer for those who need it 21.10.
the celebration of a songs of praise shared with another local church 28.10.
prayers for those who have been bereaved in this past year 04.11.
remembrance sunday and our prayers for peace in our world 11.11.
may you be blessed, may we all be blessed and our cups filled to overflowing. we give thanks for the gift of holidays and safe travels throughout these summer weeks and pray for all those returning to work, school and normal routines and responsibilities. I am on conference from Thursday this week and on holiday for two weeks from next Monday. In an emergency please contact one of the Associate Priests – contact details for all of whom are in the Chaplain’s out of office. “Our daily lives are often very full. Full of things to do. Full of meetings and deadlines. Full of places to be. Full of people to meet. For some they may be full of time on our hands. Full of hopes we would like to fulfil. Full of things we don?t want to face. Where is God during the daily life we are dealt? How do we find God in fullness, in the full-ness of life? In the Church Year, the period between Pentecost, at the end of Easter, and the Feast of Christ the King, in November, is known as Ordinary Time. At this time, we explore the question: Where is God in our ordinary, everyday life? During the next few weeks of September, we invite you on a journey to discover God Sunday to Saturday. We will be journeying with Victoria, a hairdresser, Mike, a police officer, and, on the buses, a couple called the Trenemans. These stories feature in a new booklet from LICC: The one about… 8 stories about God in our everyday.